High-Quality, Custom Booklet, Catalog and Magazine Printing. • Short Run Digital or Bulk Catalog Printing. • Bright Gloss or Elegant Matte Paper. • Premium 100lb Paper or Thicker Cardstock. • Custom Catalog Sizes, Binding and Finishing. Email Us Your Project for a FREE QUOTE. 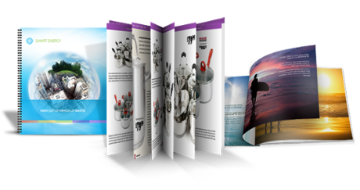 Need a Free Custom Booklet or Catalog Printing Quote? Call us at (702) 589-6429 to discuss your Company Catalog Printing needs. Superior Quality, Full Color Booklet and Catalog Printing! Our self-cover saddle stitched catalogs are printed in Full Color and come standard on 100 lb. Gloss Book with an Aqueous Gloss Coating. Gloss Book catalogs are purposely value priced with the most popular catalog printing options available, producing superior high definition print quality with maximum affordability! Catalogs are a department store standard, but you can easily use them for your business, too. Highlight seasonal inventory and specials on a quarterly basis. Provide some editorial content, creating more of a magazine/catalog hybrid. The options are limitless! From employee handbooks to glossy, full-color sales catalogs for prospective customers or technical manuals that provide valuable information for product users, a well-designed and printed booklet or catalog can be a key factor in earning trust and generating results. And with our hands-on attention to detail and superior paper stock, LOGO EXECUTIVES is the place to have your company, brand or product booklets and catalogs printed. Direct-mail catalogs are a quick and efficient way to put your products in front of a targeted audience. As a highly effective marketing medium, catalogs not only tell your customers who you are and what you offer, but also have the ability to pitch promotional offers and make ordering perfectly easy on each and every page. Like all other direct-mail marketing materials, catalogs must stand out from the competition to get noticed and ultimately land sales. We print our catalogs on high-quality paper stock to give your catalog a sturdy feel that won't easily smudge or tear in your customers' hands. We can even mail your catalogs to your customers with our direct mailing services. We can mail your catalogs directly to your customers and prospects. Contact us for details on how we can save you time and money on your direct mail catalog project and help you find new customers with custom mailing lists. We offer a choice of bulk mail or first class mail options. Call us with any questions on your catalog printing and mailing needs! Impress your clients with high-quality and appealing catalogs. Order these in bulk for added savings. We provide cheap catalog printing that fits your budget and your desired catalog printing needs. We produce your custom catalogs using our offset printers for efficient and consistent catalog printing. Our bulk catalogs can be used as product and service listings, directories, or event programs. Work on the catalog design and let us handle the professional and affordable catalog printing. Short Run Catalog Printing for Fast Turnaround. If you need 150 catalog copies or less, then our short run catalog printing service is best for you. Short run catalog printing lets you define a lower number of copies for your catalogs which is great as giveaways to small offices or for select individuals. The turnaround time is faster, perfect if you're in a hurry. All you have to do is to put together your custom color catalog printing project and submit your digital file, select the specs that suits your needs, and order away. Call us for more information on our short run digital custom booklet and catalog printing services. Customers demand information, and detailed product catalogs and booklets can generate orders by filling that need. You can build your own catalog or booklet in two standard sizes, the handy 5 1/2 x 8 1/2 Mini Booklets and Catalogs or the ever-popular 8 1/2 x 11 Saddle-Stitched Self Cover Catalog, or create your own custom catalog specs. LOGO EXECUTIVES offers anything from a simple brochure folded to make a four-pager, up to 64 pages in full color, saddle-stitched (stapled) at the spine or coil bound. Custom full color catalog printing sizes, formats and papers as well as custom catalog finishing can be used to create distinctive company and product catalog designs and shapes. Rounded corners are not a problem. UV coating is a breeze. Can you have a thicker paper on the cover than your inside pages? Absolutely! Foil stamping and embossing? Sure! Anything you can imagine we can create. Booklets are normally printed in the standard 5 1/2 x 8 1/2 or a smaller size. A custom size booklet can be printed to the exact size and dimensions that you need. Give our prepress experts a call and we'll help make a booklet layout for the graphics program of your choice so your design will print correctly. We'll also get you a price quickly.